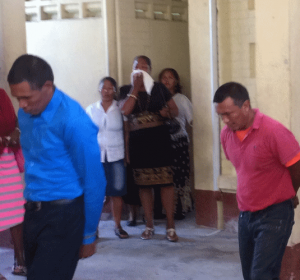 Four Colombian men, a Venezuelan woman and two Guyanese men were Wednesday charged with aiding a Guyanese man in trafficking 11.4 kilogrammes of cocaine. The Guyanese man, Gavin Adams, was charged with trafficking in the cocaine between September 1, 2017 and January 2, 2018. Appearing before Chief Magistrate, Ann Mc Lennan, they pleaded not guilty to the drug trafficking offences. 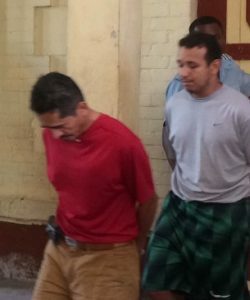 The Colombians- Yeison Andres Vallejo Sanchez, Jesus Avrello Beltron Amaya, Reginaldo Rodriguez Jaramillo, Wilinton Olarte Reyes-Venezuelan, Angelica Margarita Lara Malave and Guyanese Ian Matthias and Troy Piper – were refused bail and remanded to prison. They will next appear at the Charity Magistrates’ Court on until January 15, 2018. The Customs Anti-Narcotics Unit (CANU) says Malave of Venezuela, at Barrows Street, Phase 1 Republic Park, East Bank Demerara, aided Gavin Adams and Yeison Andres Vallejo Sanchez to traffick 11.41 kilogrammes. Investigators further alleged that Matthias and Piper of North West District aided Gavin Adams in trafficking the said amount of cocaine. They aided Gavin Adams in the trafficking of 11.410 kilogrammes of cocaine between Friday September 1, 2017 and January 2, 2017 at Grant Woodland, Pomeroon trafficked 11.410 kilohs of cocaine.